The market for electric bass guitars is always hot and different companies keep launching new products on a regular basis. 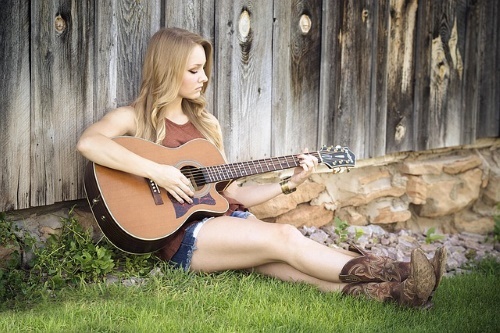 With further advancement in technology, acoustic bass guitars are losing their spot. In a time where true music is losing its touch, we have made a list of 10 best acoustic bass guitars that still stand high in the list of world’s best bass guitars. However, before skipping to that part, we’d like to introduce you to the features that you should focus on while buying acoustic bass guitars. Acoustic bass guitars may not be having the kinds of features that electric bass guitars have, but the quality of music that they produce is unmatched. Skilled musicians can produce variations even with acoustic bass guitars. 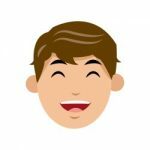 Which is why, instead of worrying about fancy features, you should be focusing on the features of relevance to ensure that the bass guitar that you buy is of good quality. Scale Length – If you’re a beginner or someone with small hands, you should buy acoustic bass guitars with a small scale-length. It is also wise to pick a guitar with a slim and non-slippery neck. Body Material – Avoid buying guitars with a cheap laminated body. A solid wood body guitar will always have better resonance and higher intonation. Type of Strings – Different strings produce different tones. If you’re looking for a guitar that can produce deep mellow tones, you should focus on bronze strings. On the other hand, steel strings are suitable for bright and punchy tones. Guitar Neck – It is not just the width of the guitar’s neck that matters, even the neck length makes a difference. Longer neck length is uncomfortable for short people. Thus, choose a guitar that feels comfortable to hold. Acoustic bass guitars are of different kinds and each piece has highlight features that usually differ from all other guitars. Owing to this diversity, it can be quite confusing to determine what instruments are best. 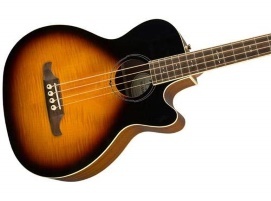 It is in this case that our list of 10 best acoustic bass guitars will come in handy. This 4-String Acoustic-Electric Bass Guitar by Best Choice has a rosewood fingerboard adorned with dot inlays. Its back, sides, and top body are made of Mahogany tonewood. It features diecast tuning pegs and is pre-loaded with 4 band equalizers. This 44-inches full-size bass guitar, having 22-frets, also features an inbuilt voice control system that increases the playability of the guitar. It has an adjustable truss rod and Lacquer coating that keeps the shine intact. This instrument weighs 6.61 pounds and has a 30-inch scale length. It has one strap button incorporated at the bottom of the guitar. Lastly, it has a seamless glossy finish and replaceable strings. 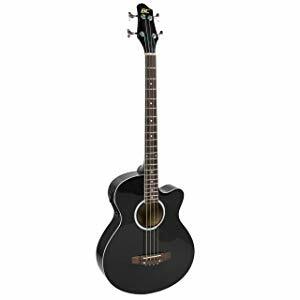 This 4-String Acoustic Bass Guitar by Ibanez produces blissful and loud music despite having a 30-inch small scale-length since it has an all-wood body construction. The back, sides and top body of this guitar are made of Mahogany tonewood. Its fingerboard is made up of high-quality dry rosewood with 20 frets. With an under-saddle pickup, this instrument has a slim maple neck that is perfect for people with small hands. This 4-String acoustic bass guitar weighs 7.3 pounds and has an adjustable neck. Lastly, it features a dotted inlay pattern all along the fingerboard that makes this guitar more playable and easier for beginners. The Dean EAB Acoustic-Electric bass guitar is one of the best sounding instruments available in the market. It has an all-wood body featuring a Spruce top and Mahogany tonewood back, sides, and top body. This instrument looks nothing less than a high-end acoustic bass guitar since its high-quality Rosewood fretboard displays a beautiful pearl dot inlay pattern. This instrument is equipped with an onboard DMT G03 Preamp system and circular Abalone inlays covering the soundhole from all directions. Also, the body around the soundhole has a multi-ply binding. Lastly, this acoustic-electric bass guitar weighs 7.75 pounds and has a natural satin-smooth finish alongside having a celluloid and rosette body binding. This 5-String acoustic-electric bass guitar is perfect for beginners and learners. It has wing-style tuners that are strong enough to release all the tension between the guitar’s neck and strings. It has a slim Sapele tonewood neck and a 23-Fret Rosewood fretboard with mother of pearl dot inlays running all along the fingerboard. This instrument also features a laminated Linden-top and Sapele tonewood back and sides. With an under saddle pickup system, this acoustic-electric bass guitar further incorporates Delron resin saddle and nut, ABS body binding, and an onboard 7545 Equalizer system that can control features like volume, treble, and sound. This bass guitar weighs 10.05 pounds and exhibits a 34-inch scale length. Lastly, all the frets are made of Nickel-alloy and the guitar has an adjustable truss rod. This Gold Tone Mbass guitar is fretless and is aided with butterfly bass-style open gear tuners. It exhibits a Mahogany tonewood C-shaped neck with under-the-bridge active piezoelectric pickup configuration. Its fingerboard is made of rosewood and its back and sides are made of Mahogany tonewood. It has a fixed bridge and neck joint with an adjustable truss rod. This hollow-body acoustic bass guitar has 2 band equalizers and one volume control switch. It also features 1-11/16-inch wide bone nut and a 25-inch scale length. This 4-String 38-inch acoustic bass guitar weighs 3.5 lbs and has a satin-smooth finish. Lastly, it has synthetic Aquila rubber strings and a slide control feature for controlling the intensity of the music produced. This cutaway style acoustic-electric bass guitar by Fender has a Laminated Sitka Spruce top and scalloped X Bracing. It incorporates a rosewood bridge and a fingerboard with 22 Frets. This 4-String Fender bass guitar also incorporates a slim Mahogany tonewood neck and an in-build active Fishman preamp system. With an onboard tuner and saddle, this dreadnought instrument has a 34-inch scale length. The fingerboard has the mother of pearl inlay pattern and this guitar also features a double-action truss rod. This bass guitar exhibits a smooth finish and weighs 12 pounds. Its back, top, and sides are made of Mahogany tonewood. Lastly, it has a LED-tuning display that makes the guitar even more valuable. Fender SCE Acoustic-Electric bass guitar has 4 strings and a solid spruce top with a Maple tonewood C-shaped neck, built for maximum comfort. This dreadnought-style bass guitar features a rosewood fingerboard, embellished with block position inlays. It has a laminated Mahogany tonewood back and sides and a 34-inch scale length. This instrument also features a Fishman preamplifier system with an onboard active pickup. It has a scalloped X bracing and in-built tuning pegs that reduce string tension. With a solid rosewood bridge and classic vintage style 3-ply golden pickguard, this bass guitar has a bone saddle with 54mm nut width. The Fender Kingman Bass SCE Acoustic-Electric Bass Guitar weighs 10.5 pounds and has a seamless finish and a slim neck. Lastly, this instrument has a forward strap button present at the center bottom of the guitar. The Washburn ABK Acoustic Bass Guitar has a solid spruce top. It features a smooth rosewood fingerboard with beautiful dot inlays. Its neck is made of Mahogany tonewood. This acoustic bass guitar also features laminated Mahogany tonewood back and sides and has 22 frets. With a cutaway-style round soundhole and rosewood bridge, this instrument is also incorporated with die-cast chrome tuners. It has a 32-inch scale length and a bone saddle with 44mm nut width. This guitar has 4 band equalizers and a separate volume and phase control feature. 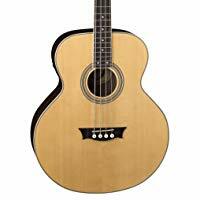 This 4-String Acoustic Bass guitar has a natural gloss finish and it weighs 11.02 pounds. Also, it is compatible with 9V batteries and has a piezoelectric pickup system configured on the guitar bridge. Lastly, the light gauge strings are easy to press and perfect for beginners. The GB30CE acoustic-electric bass guitar by Takamine is a cutaway style bass guitar with a solid spruce top and an Ebony tonewood headstock. It has a Mahogany tonewood neck with a glossy finish and strong chrome tuners. This 4-String bass guitar has an onboard preamplifier with 3 band equalizers and a condenser microphone. The back and sides of this guitar are made of Indian Mahogany tonewood and it has a smooth rosewood fingerboard with 21 frets. Additionally, this instrument has a dot inlay pattern on the fretboard and an Abalone inlay around the soundhole. The Takamine GB30CE Acoustic-Electric Bass Guitar weighs 12 pounds and has synthetic bone nuts with 45mm nut width. It also has a synthetic bone saddle and a dovetail neck joint. Lastly, this glossy guitar has a fixed bridge system. 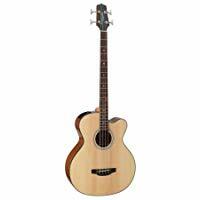 This 4-String Acoustic-Electric bass guitar by Taylor has phosphor coated steel strings with a nylon core. Its top body, back body, and sides are made of Sapele tonewood and it features an Ebony tonewood fingerboard with 20 thin frets. This instrument has a solid Sitka Spruce top and an Ebony tonewood neck and it sports Italian Acrylic dot inlay pattern all along the fingerboard. Much reasonably priced according to the standards of Taylor guitars, this one has mini chrome tuners and a Micarta saddle. It also has synthetic bone nuts with 1-11/16-inch nut width. This lightweight and portable bass guitar weighs 10.22 pounds and has a 23.5-inch scale length. Lastly, it has ES-B amplification system with tone, volume, and treble control features. LED display light makes it easier to see and adjust the display settings even in darkness. The display is loaded with a low battery indicator and the guitar has onboard tuners that can keep the buzzing under control. 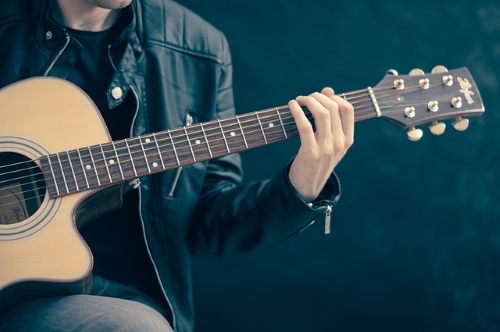 No matter you play a high-end acoustic bass guitar or a budget-friendly piece, it will always come down to your skills. 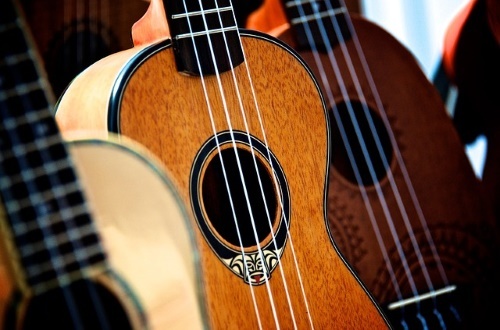 As long as you’re a skilled learner, you’ll be able to produce more natural music. However, as a professional you should mostly opt for high-end acoustic bass guitars, depending upon your budget.